Assisted by our affluent industry indulgent and proficiency in this arena, we are able to provide Topographic Survey Services. Provided services are imparted by adroit personnel who hold vast knowledge in their respective realm that assists them in imparting these services in a well-organized way. The purpose of Topographical Surveys is to gather data about the natural and man-made features of the land, as well as its elevations. Our aim here is to accurately capture whatever seen physically at the site and reproduce the same on paper, thereby giving the client an understanding of the site without having to be present at the site and aid the designers in planning. Topographic Survey is carried out to measure the elevation of points on a particular piece of land, and present them as contours on a plot. From this information a three-dimensional map may be prepared on collecting the required field data. 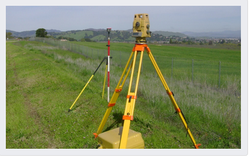 We understand that every client has different expectations from a Topographic survey. Before we take any project, our surveyor will spend time discussing with a client on their exact requirements to ensure that we provide a service which surpasses their requirements. We ensure you get a highly accurate and detailed survey. These are carried out to determine the characteristics of the details found on the surface of the earth and based on these inputs topographic maps are prepared. These maps are used in the planning stages of projects to help to design the layouts, locations of the buildings, highways etc. These are carried out to determine the characteristics of the details found in the surface of the earth and based on these inputs Topographic maps are prepared. These maps are used in the planning stages of projects to help to design the layouts, Locations of the buildings, Highways etc. Icon Cadsoft And Surveyors (i) Pvt. Ltd.
We are offering our clients Pipeline Surveys at competitive prices. Our professionals are engaged in rendering various kinds of survey works related to pipeline projects. These surveys include initial topographical strip surveys for the proposed pipeline routes or setting-out of pipeline routes and as-built surveys when the pipe is being laid down in the ground. These surveys are carried out to determine the characteristics of the details found on the surface of the earth and based on these inputs topographic maps are prepared. These maps are used in the planning stages of projects to help to design the layout and locations of the buildings, roads etc. A topographic survey or a "topo"
Topographic Surveys are used to identify and map the contours of the ground and existing features on the surface of the earth or slightly above or below the earth's surface (i.e. trees, buildings, streets, walkways, manholes, utility poles, retaining walls, etc.). Topographical Surveys are required to acquire knowledge about any geographical location in order to carry out construction projects. We undertake various topographical and geographical surveys of different locations all over India. Surveys using Total stations and GPS/DGPS. cornea. The instruments consists of illuminated placido's disc mounted on joystick with a software.